Although Father Touron failed to give a sketch of this distinguished Friar Preacher in his First Disciples of Saint Dominic, it is certain that he belonged to them, and that he was an outstanding character in the noble galaxy. Some authors say that John was a scion of the noted Guana family, and connected with the Norman princes who long reigned over the former kingdoms of Naples and Sicily. Whilst they do not give the date of his birth, practically all hold that he first saw the light of day at Salerno, some thirty miles south of Naples; that he studied at the University of Bologna; and that he entered the Order in that educational center. With one or two exceptions who give this honor to Blessed Reginald of Orleans, the writers maintain he received the habit from Saint Dominic himself. The year 1219 is the date assigned for the ceremony. Evidently John was then a man of mature years, for he was soon placed at the head of twelve other confrères sent to establish the Order in Florence. A few date this commission in 1219; but 1220 is the time ordinarily given. The choice of him for superior in so important a city confirms the statement that his rare virtue, which he had practiced from early youth, made a strong impression on Saint Dominic. Although very small of stature, the future blessed possessed a mighty mind and a courage that nothing could awe. Doubtless these qualities also appealed to the patriarch, who seemed to judge of the characters ‘ of men almost by intuition, for an able, fearless leader was needed in Florence. Dominic and John are said to have been intimate, trustful friends-no doubt, a relationship born of grace. That the saint formed a correct estimate of his young disciple is shown by the fact that our blessed soon became one of the most influential Friars Preacher in Italy. A curious story is told about the first house of the fathers at Florence. It was built, so it would seem, by one Deodate del Dado (possibly a merchant) who wished to make restitution for his dishonesty by devoting it to religious purposes. Situated in the “plain of Ripoli”, two or three miles from the city limits, on the way to Arezzo, it was better suited for a contemplative order than for one of the apostolic character of Saint Dominic’s. Mamachi thinks another community had occupied it. Be that as it may, it was free when the builder beard of the wonderful preaching of the holy man from Caleruega, in Bologna. So he hurried to that city, attended one of the saint’s sermons, and then offered the place to him. Some writers say that the proffer was accepted at once, and the delighted donor accompanied the first missionaries back to Florence. Day by day the little handful of soul harvesters left their hermitage at an early hour, in bands of two, that they might preach the word of God in Florence or elsewhere. In all things the diminutive superior, with a great mind and magnanimous soul, set the example, as well as led the way, which he would have the others follow. They assembled the people in churches, public squares, market places, open plains — wherever they could procure an audience. In the evening, unless too far away, they returned to their quiet abode for prayer and meditation. Saint Dominic is said to have been so impressed with the reports of the good’ effected by his brethren in Florence that he paid them at least one visit, and was delighted with their fervor and zeal. Their benefactor, Deodate, seems to have lived less than a year after they settled in his hermitage. His death deprived them of their principal source of support. This misfortune, together with the fatigue of walking back and forth each day between the city and the “plain of Ripoli,” caused the Florentines to obtain permission for them to use the hospice of Saint Pancratius, which stood at the side of the church of the same name within the municipal limits, until a more suitable place could be obtained for them. John of Salerno gladly acceded to the proposal, -and moved his community thither at once, for this more convenient location would be of great aid to his confr6res in their work. Florence had become one of the strongholds of the new Manicheans in Italy, whence their evil influence spread throughout Tuscany. They hesitated at nothing for the propagation of their destructive principles. In the subject of our sketch they met with a relentless foe. Day and night he opposed them, whether by deed or word. Never was he known to quail before their threats or attacks. His fearless action and preaching not only produced the most salutary effects, but even won for him the name of “hammer of heretics.” He must ever rank high amongst those brave Friars Preacher who helped to free the Italian Peninsula from the dangers of Manicheanism and Albigensianism. Whatever he did, the man of God was doubtless guided by the lessons which he had received from Saint Dominic. 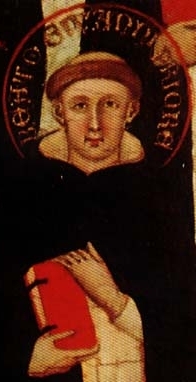 He had lived under the patriarch at Bologna, had met him in Florence, and of course bad come in contact with him at the general chapter of 1221. Some writers say he was the saint’s travelling companion on several apostolic journeys; but this statement seems doubtful. However, such was his love for the Order’s founder that he no sooner received word of his serious illness than he started in all haste for Bologna, where he arrived just in time to receive the dying man’s last blessing and the assurance that he would be more helpful to the infant institute in heaven than he could be on earth. Such is the importance which one saint attaches to the word of another, that we are justified in believing those of Dominic must have acted as an inspiration for Blessed John of Salerno the rest of his life. So labored on Blessed John of Salerno until the end of his useful life. Father John Caroli and other earlier writers speak of his toil and his heroic virtue in terms of the highest praise. They tell how he was loved and venerated, how his confr~res mourned his death, and how the people of Florence turned out in a body for his funeral; but they give us no further indication of its date than to say that it happened after many years of faithful labor (“quumque inultis jam annis . . . . . laborasset”). In the light of this assertion that he surrendered his pure soul to God in Florence after long years of constant service, one can not accept the statement of those later authors who say that he died in 1225. As a matter of fact, the Année Dominicaine assures us that Gregory IX, who ascended the papal throne in March, 1227, entrusted him with some reformation work in the Diocese of Chiusi, which he brought to a happy termination. The same publication, by way of guess, places the holy man’s death in the thirties of the thirteenth century. Yet it is just as probable that it occurred in the following decade.